As a member of staff who is running an OLAF exam, you will be sent an email containing the link to the exam check page when your exam is ready for you to check. The exam check page makes it easier to check OLAF exam questions and settings (randomisation and feedback to students). Exams will appear on this page if they have the word OLAF in the title (e.g. ‘BIO1001 23rd May 2017 OLAF’) and the Available from setting is for a date in the future. Please read the notes below before using the page. 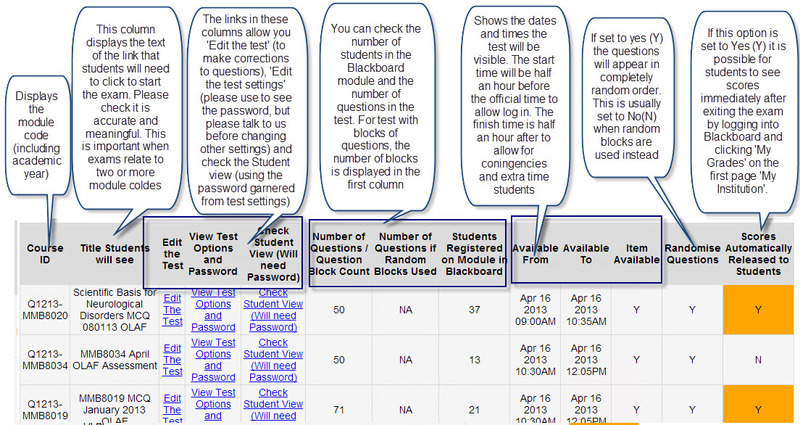 If you click the links on the page you will need to log into Blackboard with your standard username and password. If you believe the settings are wrong, please contact OLAF Admin so that we can make the changes for you and ensure they are not reset later incorrectly. Some of the options we use for exams may seem counter-intuitive. They may be set as they are for a reason. The start and end times are deliberately set to be available early (30 minutes before the start) and become unavailable 60 minutes after the finish. This is to allow students to get logged in and ready to enter the exam password at the start time.The extra time allows for students entitled to extra time and empowers the invigilator to give extensions if the group or individual students experience technical issues. The invigilator tells the students when to stop. The test is only visible to students during the Available from and Available to period. Even then, a password is required. The password is changed after the exam starts. The page consists of a table with data about the exam and links to Edit and View the test and settings. Click the image below to expand and see the explanations. To access the page use the link that has been emailed to you by the OLAF team. Please check the Available from and Available to columns to check the dates are correct (and that the time is correct with half an hour before, and 45 minutes after the official start and end times). Please check the columns for Randomise question and Scores are automatically released to students to make sure they are correct for your exam. Please check the Title of the exam. This is what the students will see in the exam room. Please contact olafop@ncl.ac.uk if you think this will not be meaningful to them. This is particularly important if there are exams in similar subject areas taking place, or if the same is exam is happening under two module codes. Delays can occur if students click the wrong link. To edit the test or see the test in it’s entirety, click Edit the test. Sign in with your standard (Blackboard) username and password. Click View the test options, log in with your Blackboard username and scroll down the screen to find and note the password. Return to the exam check page (the link that has been emailed to you by the OLAF team) and click Check student view. Log in with your standard username and password. A screen will open showing the instructions for the exam (this includes general information about the exam, as well as any specific instructions that have been created). Click Continue to move to the password screen. Enter the exam password you noted earlier, and click Submit. Work through the questions using the forward and backward arrows. You can quickly check both the questions and answers to a test as an instructor. We also recommend checking the student view of the exam to see the final format. Go to the module and the OLAF Admin area on the menu at the left. Ensure ‘Edit Mode‘ is On. You should see the exam at the bottom of the screen (scroll down if necessary). Click the downward pointing arrow next to the name of the exam. Scroll down to check the questions and answers. In particular, please look for any problems with special characters (accents, Greek characters or equations) as well as images. Go to the module and the assignments area on the menu at the left. You should see the exam at the bottom of the screen (scroll down if necessary). Click the downward pointing arrow to the right of the exam name. Click ‘Edit the test options’. At the bottom of section 2 you will find the password that has been set (not necessarily the final password that will be used on the day of the exam – the exams office set that nearer the time). Note the password. Scroll to the bottom and click ‘Submit’. Click the name of the exam to take the test. Enter the password you noted earlier. Work through the exam. In particular, please look for any problems with special characters (accents, Greek characters or equations) as well as images. Screens may vary slightly in terms of contrast and resolution. Ensure that images are very clear, particularly where detail is important. Make sure that arrows or labels are suitable such that if the colour is slightly off on the monitor, or light is shining on the screen, the information can be ascertained. Use dark colours and reasonably thick lines if possible. 1. What geometric term is represented by the image below? Remember that the questions will be displayed ‘one at a time.’ Images that are required for more than one question will have to be repeated. Figure numbers are unnecessary.